In the twelve years that he has been in the public eye, Sachin Tendulkar has been explosive on the cricket field and just as reticent off it. He was barely fifteen years old when he first wrote his name into the record books with a stupendous 664-run partnership with his childhood friend Vinod Kambli. Two year later, he struck his first century in first-class cricket. At eighteen, he became the second youngest man to make a hundred in international cricket, and after that there was no looking back. Records tumbled by the wayside as he captivated audiences first in his home city of Mumbai, then in the rest of India and all over the cricket-playing world. Today, Sachin is widely accepted as the world's finest batsman, with impeccable technique, an incredible array of strokes, and maturity far beyond his years. His teammates and friends swear by him, his fans worship him and there are few, if any, critics of his game or his temperament. In this biography of the hero of Indian cricket, sports writer Gulu Ezekiel mines interviews, press reports and conversations over the last decade to create an accurate and sympathetic account of the man and his first passion: cricket. He tracks Sachin from his childhood when he first caught the bug of cricket, through his early performances in the Ranji Trophy and other domestic tournaments, and follows him on his meteoric rise to international stardom. 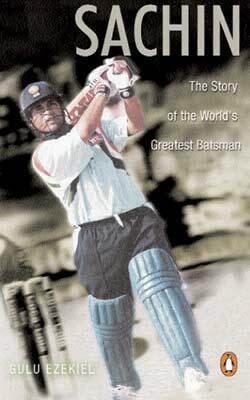 With unfailing attention to detail, he reconstructs the crucial matches and events that marked Sachin's career and unravels for us the magic of the charismatic cricketer whom Wisden once dubbed 'bigger than Jesus'.